Surviving with Sprains and Broken Bones. When help is not on the way! Sprains and broken bones happen and they happen often. From a simple sprain to minor and compound fractures, injuries effecting mobility can be one of the lengthiest and most uncomfortable to overcome. Is it possible to treat and immobilize the injury long enough to function and allow healing until help can be found? Will you be the burden or can you still be a productive member of your group? Do you have the knowledge and the skills to overcome such an injury in a wilderness or disaster environment when there is no help? Coming Sunday 6/10/2018 at 7:00pmEst 4:00pm/Pt we are joined by medical experts Dr. Joe Alton and Nurse Practitioner Amy Alton to discuss how to avoid, the procedures in diagnosing, and how to treat bone injuries. Do not be the burden to yourself or those counting on you. Learn what you you can do to help yourself and those that count on your support. This broadcast “Surviving with Sprains and Broken Bones” is open to live listeners with questions. Call in or post in chat room during LIVE broadcast your related question for this topic. In this 1 hour special we will also be discussing 3 newly scheduled classes every prepper, survivalist, or outdoor enthusiast should attend. Just announced by Dr Joe Alton and Nurse Amy Alton these intensive classes will provide you the knowledge to overcome medical adversities in times of disaster. 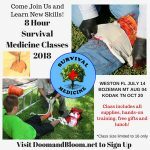 The Advanced 8 Hour Survival Medicine Class is coming to Weston, FL July 14, Bozeman, MT August 4, and Kodak, TN October 20. See details HERE! Time permitting, we will also talk about what’s been a hot topic for many, active shooter response and safety. It’s not all doom and gloom. There will be plenty of bloom as well in what’s sure to be one of the most informative and fun shows you do not want to miss. Visit Doom and Bloom website HERE! For all your wilderness and disaster supplies visit Doom and Bloom Store HERE! Don’t miss this eye opener coming Sunday 6/10/2018 at 7:00pmEst 4:00pm/Pt as we are joined by medical experts Dr. Joe Alton and Nurse Practitioner Amy Alton to discuss how to avoid, the procedures in diagnosing, and how to treat bone injuries.